Boats are one of the best transports in water. And when you are having a boat, you will surely like to make it more efficient with its equipments and entertainment. Most of the people choose the boat for a fun and entertaining ride, and it adds the compliment if there is a stereo system. For the boats, there are some of the marine stereos, which are specially designed for the boats and are waterproof, so that your fun doesn’t stop. One can have the marine stereo from some of the companies, which deal with all the equipments from the anchors to the electronics and equipments for the boats. If one, search out for a marine equipment company, they can have different companies, which can offer them the products or equipments they require. And there are also some of the best online stores like Safe Sea Shop, which helps anyone to choose their desired products from the websites and are very efficient and time saving. If you are searching for the best marine waterproof stereo, then you have it from our online marine store, which offers the highest quality products and at a very reasonable price. 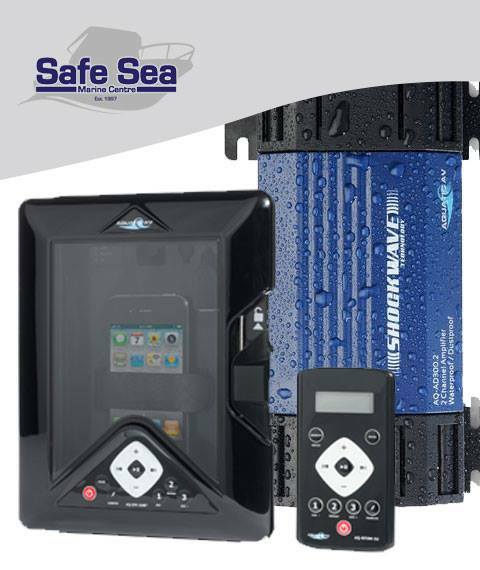 Why Safe Sea Marine Store? In our electronics section you will find anything from audio, to antennas, connectors & GPS solutions, AV equipments and a wide variety of electronics products. Safe Sea Marine Center only offers the best products from the leading brands, which will make your customers satisfy and will give a memorable boating experience. This entry was posted in Boat Accessories and tagged AV equipments, GPS solutions, Marine electronics, waterproof stereo. How Alarm Senders Offer Security to Boat-Passengers?